Over the days leading up to the 25th of December I’d like to give something to everyone who stops by my blog. 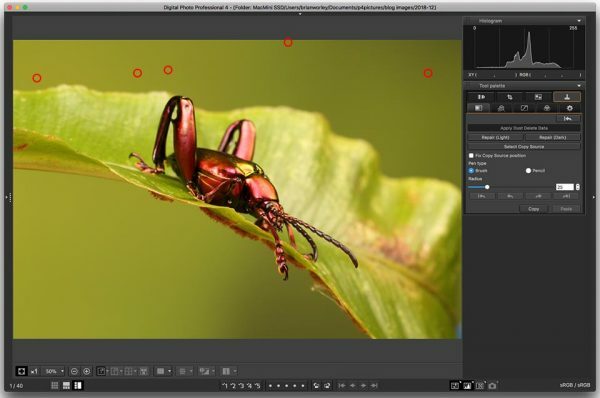 These tips cover camera settings, flash, lighting, software and gear. I’ll be providing a pair of tips each day until 25th December. Dust delete data is a map of where the spots of dust are on your camera sensor. You can map those points with the camera, and then each file captured includes the dust spot map inside it. It only adds minimal space to your image files and doesn’t slow the camera down at all. 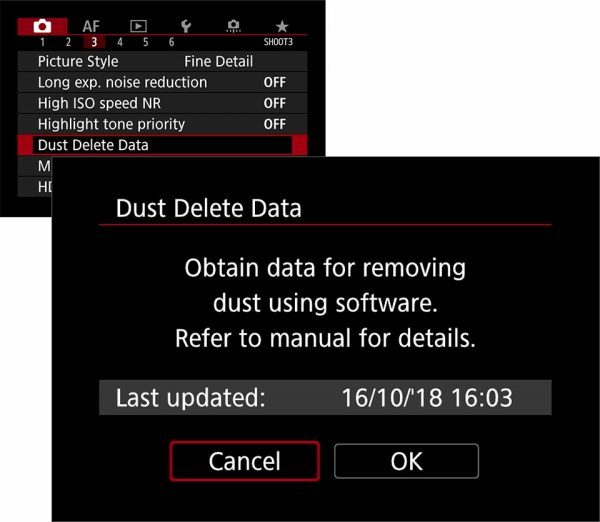 Once you have the files, Canon’s Digital Photo Professional software can be asked to read the dust delete data and automatically clone out the dust spots for you – just brilliant. A while ago I shot some macro shots of various creatures with the good people at Wild Arena. Shooting macro shots with smooth out of focus backgrounds at f/14 or more soon showed that my camera sensor was pretty dirty. You could see the spots on the camera LCD when you zoomed in! If you want to check how clean your sensor is, take a shot of the sky with an aperture of f/16 and your lens at it’s minimum focus distance. You’ll soon see the dust spots. So what I did was get a sheet of plain white paper and use the camera dust delete data function to create that dust map. Then all my shots for the rest of the day included the dust map. When processing I applied the dust delete data in DPP, and it removed all the dust spots automatically. 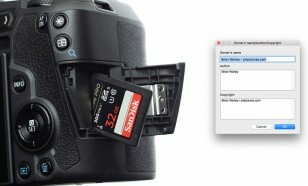 What a timesaver – my sensor was a mess. Once the file was open in DPP, simply select the button to Apply Dust Delete Data and my image was dust spotted for me. I’ve marked the most obvious dust spots on the image with red circles, before (above) and after (below). There were actually many more spots the closer you looked but dust delete data fixed them all. If you find your sensor is really dirty, you should get it cleaned, you can do it yourself, or seek a professional to do it for you. 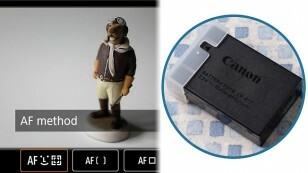 Canon’s service facilities can clean the sensor for you too. The lock switch is found on the back of many mid-range and advanced EOS cameras, and it could save your shots. If you are in the habit of leaving the camera switched on so your camera is always ready to take photos, just a touch of the shutter to wake it and start taking photos. If you also carry the camera on it’s strap there’s a good chance that one of the controls on the back of the camera may be moved and settings changed. The lock switch prevents this, and for many cameras it’s pretty flexible too. Historically the lock switch was part of a three position power switch, but now you can lock independently of the power switch. That also means that the switch can now be customised to lock a range of dials and buttons. If you try to move one, you get the LOCK indication on the LCD, in the viewfinder and also on the camera’s top LCD panel, just like the shot above. 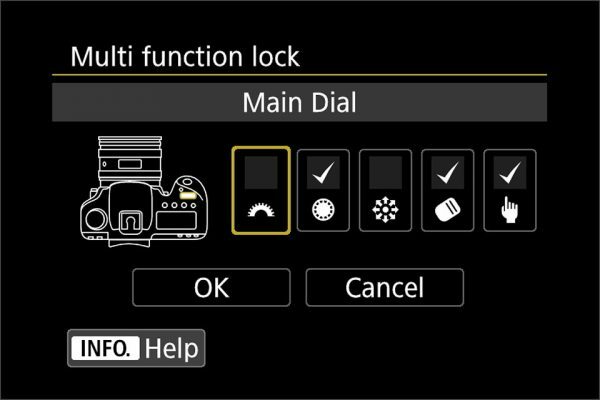 With configuration settings, several different controls can be locked, in this case the EOS 5D Mark IV can be configured to lock the main dial, quick control dial, multi-controller, AF area selection button and or the touchscreen. 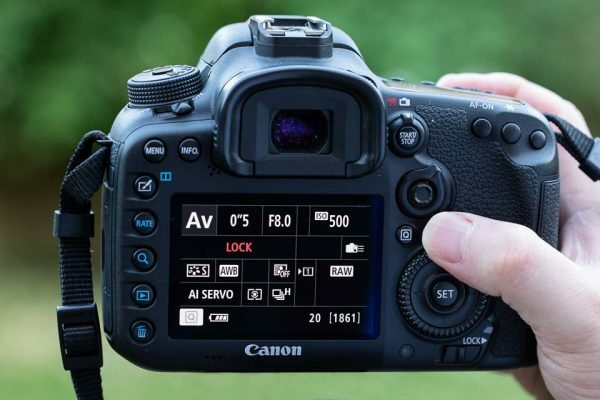 On the 5D Mark IV, I choose to lock the quick dial, AF area selection button and also the touchscreen.